If you work with Oracle, then you don't need to be told that the data dictionary is large and complex, and grows larger with each new Oracle release. It's one of the basic elements of the Oracle database you interact with regularly, but the sheer number of tables and views makes it difficult to remember which view you need, much less the name of the specific column. Want to make it simpler? 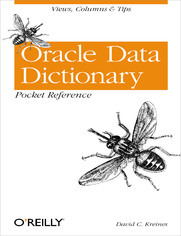 The Oracle Data Dictionary Pocket Reference puts all the information you need right at your fingertips. Its handy and compact format lets you locate the table and view you need effortlessly without stopping to interrupt your workOracle Data Dictionary Pocket Reference gives DBAs and developers at any level quick and easy access to the data dictionary in Oracle's latest database, Oracle9i. This pocket-sized book provides a complete list of the most commonly used tables and views in the Oracle9i data dictionary, intelligently arranged for quick reference. It also includes column names and descriptions for each of the tables and views, as well as helpful tips, warnings, and usage examples.O'Reilly's Pocket References have become a favorite among developers and database administrators everywhere. By providing a wealth of important details in a concise, well-organized format, these handy books deliver just what you need to complete the task at hand. When you've reached a sticking point in your work and want to check your facts quickly, the Oracle Data Dictionary Pocket Reference is the book to have close by.